There are plenty of things you can do as a parent to help your child start the school year strong! The school year is well underway, and there are all sorts of ways parents can be actively involved in their child’s education. Sometimes, parents of children with disabilities feel overwhelmed with making sure their child is getting everything they need to be successful in school. Here is a few beginning of the school year tips for parents of children with disabilities. 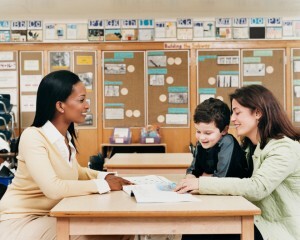 Many parents struggle with keeping track of all paperwork and documentation that is related to their child’s education. One of the best ways to stay on top of everything is to find a way to stay organized! Try to find a system that works well for you. For example, a calendar of special education meetings, conferences, and school-related functions can serve you well. You can also keep a file that holds all sorts of documentation that relates to your child’s education. Whatever you decide to do, make sure that all relevant information is easily accessible. As a parent of a child with disabilities, you always need to have a clear understanding their IEP. This is because their IEP is a quintessential part of their education. At the beginning of every school year, you need to make sure that it accommodates your child’s individual needs! If you have any questions or concerns, you will want to contact your school to get everything sorted out. It can be beneficial in many ways to meet your child’s teacher at the beginning of the school year. For one, you can go over anything important you want them to know about your child. That way you are both on the same page throughout the year. You can either try and set up an appointment to meet with your child’s teach one-on-one or you can meet them at a back-to-school function like Back-To-School Night or Open house. Also, this is a great chance for you to meet other families in the area. This entry was posted on Friday, October 6th, 2017	at 12:58 pm	. You can follow any responses to this entry through the RSS 2.0 feed. Both comments and pings are currently closed.